Bomber Brewing in Vancouver has re-released their collaboration with Stone Brewing this year in tall cans called the “Blood From A Stone Red Rye IPA”. The beer pours a deep reddish copper colour with a tan head. The aroma consists of rye and caramel, with mango fruits and floral hops. The flavour is of rye and rye spice, caramel, earth, mild citrus, maybe mango, mild resin and bitterness. The alcohol content comes in at 6.8% and an IBU of 50. Much like last time this was released in 2014 in Bombers this stuff is quite tasty. Commercial Description: By using American yeast and hops, along with Canadian rye and malted barley, we have created a smooth and spicy IPA with creamy body and clean, dry finish. Calypso and Ella hops add tropical notes to the rye and malt aromas in this rich Red Rye IPA. From Torque Brewing in Winnipeg Manitoba comes their “Red Line Red IPA”. The beer pours a deep reddish colour with a tan head. The aroma consists of caramel fruity mild roast and floral hops. The flavour is of caramel, toasted malts, citrus, grapefruit, pine, some resin and bitterness. The alcohol content comes in at 6.5%. Torque Brewing in Winnipeg has started out pretty strong so far and this beer is just anouther example of this. From Winterlong Brewing Co located in Whitehorse of the Yukon Territory comes their “Sinister Rouge” Red IPA. The beer pours a deep reddish amber colour with a tan head. The aroma consists of citrus, tropical, caramel and some floral hops. The flavour is of pine, tropical fruits, lemon, caramel, toffee, earth, resin and a good hit of hops bitterness. The alcohol content comes in at 7.0% with an IBU of 43. This was my first ever taste of Winterlong Brewing’s beer and if this is any indication then they are making some really good beer. If you can find a way to trade for a bottle or purchase one if you are in the Yukon then do it. You will not regret it! Commercial Description: A unique spin on the standard IPA, with a tropical fruit hop punch up front, backed by the caramel and toffee malt profile of an amber ale. 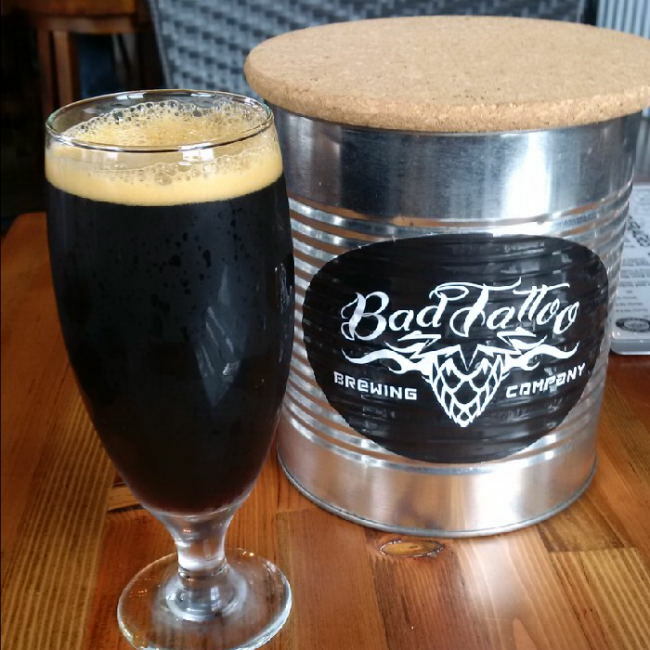 From Penticton’s new Bad Tattoo Brewing comes their “Red IPA” a beer that pours like a stout but tastes like an IPA. The beer pours a deep brown colour with a brown head. The aroma consists of sweet caramel malts, floral hops with lots of roasted notes. The flavour is of chocolate, coffee, roasted malts, caramel, tropical fruits and a medium hops bitterness. I think the bitterness is being masked by the roasted flavours. The alcohol content comes in at 6% with an IBU of around 60. This beer is a mix of a stout, red ale and an IPA and actually works quite well. If you are in or around Penticton stop in and try a glass.